You don’t have to look far to find a PDF application these days, but separating the wheat from the chaff to find a competent and flexible tool is becoming tougher. A few years ago creating a genuine, correctly-formatted PDF would require an expensive license for Adobe Standard, but these days you can download free virtual printers and even generate PDFs from office suites. However, these free or bundled tools usually only offer the bare bones. If you’re looking for an all-in-one PDF reader, creator and editor, the latest release of Nitro PDF should provide you with all of the features that you need without breaking your budget on a product from Adobe. With Nitro Pro 7 you can create a PDF from one or more different file types, convert PDFs to other file types, extract key data from documents, edit documents and apply secure access requirements PDFs. In the next two week, we’re giving away 50 free copies of Nitro Pro 7 worth a whopping $6000 in total! The first launch of Nitro Pro 7 will display a “Getting Started” screen which highlights some of the application’s features. You can easily disable this via the Do not show at startup checkbox but it is worth spending a moment looking at the various tasks on offer. Everything is organized using the familiar ribbon menu that you might find in Windows Explorer or the different Microsoft Office applications and as such the features on offer are sensibly presented. For instance if you wish to convert a PDF to another format you will find the buttons on the Home tab; editing a PDF is possible via the Edit tab and adding passwords and redactions is via the controls available in the Protect menu. Meanwhile via the Forms tab you can create forms on your document that comprise of text fields, radio buttons and checkboxes, as well as export and import data to and from a form on a PDF. As the PDF format has become more and more widely used so the requirements for protecting and validating the contents of such documents has become increasing paramount. Accordingly, Nitro Pro 7 features effective password, certification and redaction tools that are suitable for use in all levels of business. Found on the Protect tab, the redaction tool can be used to highlight text that should be blocked out from unauthorized viewing, and removed completely using the Apply all Redactions option. Meanwhile Digital IDs and Signatures can be applied to a document, useful for establishing trust between yourself and the recipient of a PDF document that you have created. Elsewhere, the Password Security setting allows you to set various passwords and profiles for the document, each with different privileges; for instance you can set a PDF document as being read-only for a specific password and even block printing altogether. It so happens that I have a pretty important PDF-related task which I need to resolve. I have three documents, all in PDF format but each with a different page format that I need to combine into a single document. Can Nitro Pro 7 help me out? As it happens, yes it can. Using the Combine button on the Create section of the Home menu, I was easily able to merge the three documents – plus a cover – into one. The process is simple, requiring you to first browse for the PDF files (or indeed any other file type) and add them. Following that, all you need to do is save the combined document – with a meaningful file name, of course! The preview view above shows two of the combined files – you can see the differences in artwork between the strips. Note that you’re not restricted to PDF documents here as you can also combine other document types into a PDF. For instance, you might wish to combine a Word document with an Excel spreadsheet. If you’ve ever found yourself having to recreate a PDF document from scratch because the source file was lost then you will know that this is often a long and drawn out process that pretty much requires you to type the document into a word processor and save or convert it to a PDF. PDF editing tools have been available in the past but they can prove to be difficult to use and expensive. Fortunately Nitro Pro 7 features an easy-to-use editing tool which delivers good results. Available via the Edit tab, you can begin editing text by selecting the Edit button which opens the Text Tools Format view. Using this you can select sentences, append or amend, add and remove images and even watermark the document. If you have problems editing an OCR tool is provided to convert the text so that it can be edited. As pictured above, right-clicking a block of text and selecting Edit Text will also allow you to edit the document’s contents. Note also that pages can be deleted and inserted or even rotated – useful if you have a page-sized image that would look better oriented in a different way. While PDF is a popular format, it isn’t the only one suitable for e-books. Sadly it isn’t possible to accurately convert a PDF document to all current e-book formats, but fortunately Nitro Pro 7 features the ability to convert PDFs into a format that is more flexible in this respect: Microsoft Word’s DOCX format. In fact, documents can be converted and exported into plain text and rich text formats, as well as images. The results of a conversion to DOCX – performed via the Convert section of the Home tab – can be seen above. When in this state, the document can be reformatted and then converted into a variety of formats depending on your requirements. 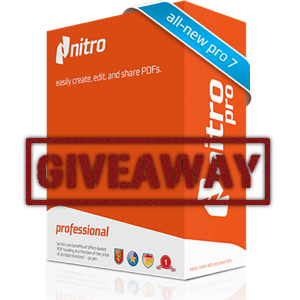 Nitro 7 Pro is certainly as good an option as any of the Adobe PDF creation applications and certainly among the best of this type of software. As you can see from the screenshots above the results of my own PDF editing project were extremely favourable; this software has enabled me to perform a task that has for a long-time proved difficult and time-consuming. Additional features that allow text editing and password protecting documents is similarly accomplished, resulting in a PDF solution that is every bit as good – if not better – than anything Adobe has ever released. Download a fully-functional trial now and take it for a spin. As a special treat to MakeUseOf readers, we’re giving away 50 copies of Nitro Pro 7 worth $6000 in total over the next two weeks. Here’s how you can score a copy for yourself. This giveaway begins now and ends Friday, February 17th. The winners will be selected at random and informed via email. Explore more about: Digital Document, MakeUseOf Giveaway, PDF, PDF Editor. I am no longer positive the place you are getting your info, however good topic. I needs to spend some time finding out more or figuring out more. Thank you for magnificent info I used to be searching for this information for my mission. Pretty element of content. I simply stumbled upon your site and in accession capital to say that I acquire actually enjoyed account your weblog posts. Any way I'll be subscribing in your augment or even I success you access persistently rapidly. Thank you very much! I really enjoy this software. I've just received your mail. Thanks a lot! Congrats to all 49 co-winners! hope i'm not late!!! good luck everyone!!!! Using Nitro Trial, really like it alot! really great giveaway...Thanks a lot for this offer............i will be glad to win one. Can't wait to win this...I hope! Thanks and I hope I get one! Am I too late ?? This would be a great thing to win. I love reading the newsletters! Awesome giveaway! Thanks for the chance at winning a sweet pgm! All-in-one ... super giveaway. Count me, please. I hate Riibon interface! Hang It! Off with his head!! And off with Nitro! I hope I win, this is my most usefull stuff (I have nitro 5). Thank you for recognizing Nitro PDF. It has helped me streamline so many tasks and made my life much easier. I have Nitro PDF 6 so it would be great if I got upgraded to 7. I work with PDFs a lot and Nitro PDF has been a blessing. In levels of satisfaction, I would rank it above Microsoft Word. Cheers, Nick! Thanks for dropping by! Really a great giveaway for document conversion software! Great software! Count me in for the giveaway! Nice Software offer, for those whom recieve the offfer I wish you the best in it's use. Is very good program. Is easy to use. makeuseof just keeps working its' way to being one of the best sites on the internet. I always recommend it to all of my friends. The info is just great and so easy to access. Keep up the good work!!!! Hope i stand a chance. thanks for the nice giveaway. count me in. Thanks and I hope to win license. As someone who reviews government PDF's & others almost daily this is a must. Please include me in your contest. I don't have the usual Facebook or others because I'm too busy RE-WRITING PDF files for reference. HELP. do you still have copies of this program to assign? Of course, the giveaway ends next week. Nice Giveaway, as we all know there are very few tools and web services using which we can play with our pdf files. Especially when it comes to editing and related functions. Excellent giveaway. I've used both NitroPDF ver 5 & ver 6 and have been very pleased with them. Love to have a license for ver 7. Nice giveaway!Best program for working with pdf files. Have used previous, free versions of Nitro. It waould be great to have the latest FULL version! Thanks!! Thank you for the giveawa! Thanks for giving some real good stuff! really great giveaway and really great and best PDF software! thank you for this nice contest and chance to win very good, useful and needful software!